The Uruguayan cuisine has been heavily influenced by the Mediterranean ones. Other influences include Germany, Russia (and other countries nearby it) and Africa. Who would have thought? Popular foods in Uruguay include sausages, steaks, pies, pastries, barbeques and some Italian foods like pastas, polenta, pizza and farinata – the latter two peculiarly even together! They also have a thing for desserts and sweets, dulce de leche being particularly popular (for a good vegan dulce sin leche recipe, see Vegan Cupcakes Take Over The World). The recipe for this bean salad definitely made me think of Mediterranean food, though I guess if it was Mediterranean it would also contain loads of garlic. 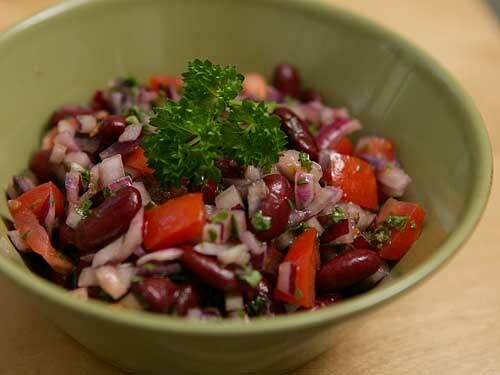 I made it using kidney beans (I don’t like pinto or fava beans), used a little mild chili powder instead of red pepper flakes, canola oil instead of olive oil (I don’t use olive oil, believe it or not) and red onion instead of the white onion called for. I’d recommend using freshly cooked beans instead of canned ones. I never use canned beans for anything. Although the recipe did not mention anything about letting it sit, I made it a day in advance. Which was a very good idea, as originally it didn’t taste all that special, but after sitting for one day it was fantastic. Tasty, easy, inexpensive and healthy – I’ll definitely be making it again. Mix all the ingredients together. Let sit for 12-24 hours before eating. Makes three portions as a side. This entry was written on March 23rd, 2010 by Maija Haavisto and filed under Salads, South and Central America. Täälläpäin olen myös syönyt jotain tuontapaista salaattia.Pitäiskin laittaa joku päivä. I just found your blog today! I’m moving within the year to Uruguay and need veg recipes badly. Thank you! What a gorgeous blog you have! I can’t wait to go through your blog archive. So many great looking recipes!